PICTURED: Crude oil from Simon Bridges’ scalp fills Wellington’s harbour. 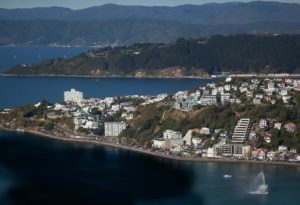 A state of emergency has been declared in Wellington this morning, after a leak in the hairline of National Party leadership contender Simon Bridges resulted in a spillage of close to fifty tonnes of crude oil into Oriental Bay and the surrounding harbour region. Preliminary assessments have blamed the spill on a structural fault in Bridges’ hairline, but some witness accounts now suggest there may have been undue tampering with the MP’s hair just prior to the incident. Bridges is said to have been out and about on the Wellington waterfront today, meeting voters who will play a crucial lack of any role in deciding whether he becomes his party’s leader in the weeks ahead. One witness, who wished to be identified by name but really shouldn’t be so greedy, said he or she saw a young woman request to touch Bridges’ wet mop. Bridges told her no, and recoiled when she repeatedly attempted to anyway. The witness believes she got a hand to Bridges’ hair on numerous occasions, potentially with enough force to have caused a rupture. Maritime New Zealand is working with Wellington’s regional council to develop a plan to contain and eventually clean up the spill, but Bridges himself has yet to be located. There are growing fears he has already been washed far from shore, and is continuing to spill oil into the environment. A spokesperson for Maritime NZ said it was “paramount” that the MP was found “as quickly as possible”, as it is unknown at this time just how many tonnes of crude oil is contained beneath his hair’s gelatinous surface. The bay’s wildlife has already been mercilessly coated in the oil from Bridges’ head, including Speaker of the House Trevor Mallard, who was forced to come ashore after diving into a thick black pocket several hours ago. Many good natured Wellingtonians have taken time off work this afternoon to make their way down to the beach, in an effort to help clean the oil off Mallard, though it is believed the process could take weeks. Bridges’ leadership rival, Judith Collins, is angry about the spill, accusing him of doing it deliberately in order to gain the support of MPs from her faction of the party.